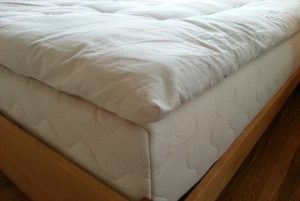 The Natural Sleep Store carries a variety of organic mattress toppers to add some cushion to the top of your mattress. Our organic mattress toppers are made with an outer of organic cotton with a core of either organic wool, natural latex, or both. These toppers can be used to reduce pressure points and add a more comfortable feel to a firmer mattress. Top any mattress with the luxurious Honest Nest organic wool topper by TFS Honest Sleep! This organic wool topper is made with layers of organic wool batting and covered in organic cotton fabric. Approximately 4″ thick. Available with a 7 oz. Organic Cotton Twill cover or an upgraded 12 oz. Organic Cotton Jacquard Cover. Made with no petrochemicals or flame retardants! $338.00 – $498.00 An organic wool topper wrapped in organic cotton! 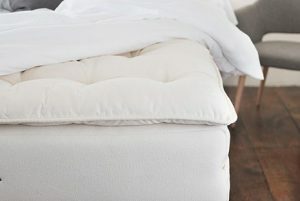 This amazing mattress topper is made from a 300 thread count organic cotton sateen fabric with USDA certified organic merino wool quilted in between. Approximately 1.5 inches thick. The sheep are raised organically in the Kyrgyz Republic and the wool is processed organically. 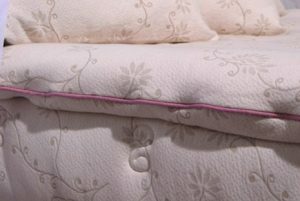 Mattress toppers have been tested to be free of arsenic, lead, and VOC's (Volatile Organic Compounds). Comes in a reusable cotton bag. $279.00 – $339.00 Organic merino wool mattress topper in 1.5 inch thickness. The cloud like comfort of a wool topper is an excellent way to make a mattress feel cozier. 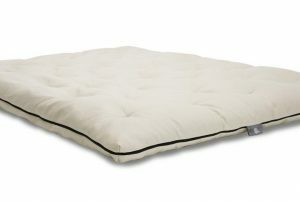 The Suite Sleep Deluxe Wool Topper uses American Dream Wool that is covered in 300 thread-count organic cotton sateen. American Dream Wool is locally sourced from family farms along the Front Range of Colorado. The happy sheep are never dipped or clipped, and spend their days grazing on pesticide free Rocky Mountain grasses. Made by Suite Sleep in Boulder, Colorado, the Suite Sleep Deluxe Wool Topper is machine tufted to create an even feel throughout. Elastic straps keep this cozy cushion in place. $359.00 – $629.00 3 inches of American Dream Wool encased in organic cotton sateen adds a dreamy feel to your mattress. The Freefrom 3 inch Convoluted Natural Latex Topper is an excellent addition to mattresses that need extra pressure point relief or to provide a more luxurious feel. This all natural topper is made with 3 inches of natural Dunlop latex with a convoluted surface, and is wrapped in GOTS certified organic knit cotton fabric. It’s free from dangerous outgassing, flame retardant chemicals, and polyurethane foam. This is the ideal healthy mattress topper–providing cushion and extra support with superior breathability. $450.00 – $750.00 Three inches of convoluted natural dunlop latex wrapped in stretchy organic cotton knit for superior comfort and breathability! 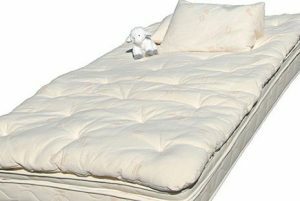 Made with 2″ of soft natural dunlop latex and wrapped in a casing of GOTS-certified organic cotton, the Little Lamb Topper offers pressure relieving support to Twin and Full-sized mattresses. Or when used in conjunction with the Little Lamb Mattress, it creates the comfortable “Grow With Me” sleep system as your child grows. $429.00 – $549.00 Kid's soft 2 inch natural latex topper. $700.00 – $1,100.00 Two inch natural and organic latex topper. Add extra comfort to your mattress! Plus take an additional 20% off! 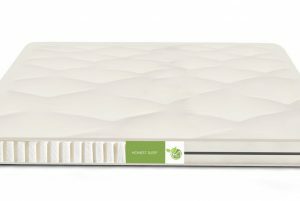 Top any mattress with the fantastic Healthy Nest organic latex topper by TFS Honest Sleep! This organic latex topper is made with 2 inches of organic dunlop latex (available in soft, medium, or firm) and covered in organic cotton fabric. Approximately 4″ thick. Available with a 7 oz. Organic Cotton Twill cover or an upgraded 12 oz. Organic Cotton Jacquard Cover. Made with no petrochemicals or flame retardants! $498.00 – $738.00 An organic latex topper wrapped in organic cotton! $289.00 – $379.00 Kid's tufted wool topper, 1.5 inches thick. Top any mattress with the vegan Happy Nest organic cotton topper by TFS Honest Sleep! Organic cotton batting covered in organic cotton fabric. Approximately 4″ thick. Available with a 7 oz. Organic Cotton Twill cover or an upgraded 12 oz. Organic Cotton Jacquard Cover. Handcrafted in San Francisco and made with no petrochemicals or flame retardants! $270.00 – $438.00 An organic cotton topper wrapped in organic cotton! The Inari Organic Wool Topper by Sleeptek consists of approximately 3 inches of pure soft wool that provides comfort and support while encased in 100% organic cotton fabric. Increases the comfort of any mattress. Pure wool regulates body temperature for comfort in all seasons. Quilting ensures long life and prevents filling from shifting. Can reduce tossing and turning by 50%! Read more about the organic rubber, organic wool, organic cotton used to make this natural mattress topper. 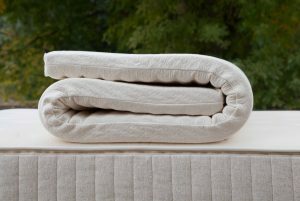 $665.00 – $1,079.00 Three inch organic wool topper with an organic cotton cover. The Sleepy Sheep wool topper is one of The Natural Sleep Store’s most affordable wool toppers. 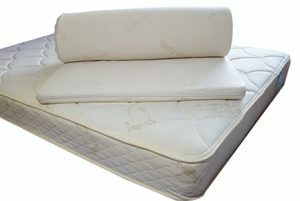 It is a great choice for adding extra cushion and comfort to your mattress. It’s handmade in Washington State with natural, pure virgin eco-valley wool encased in an organic cotton damask cover. This wool topper is three-to-four inches thick and hand tufted with wool yarn. The Sleepy Sheep wool topper is ideal for those wanting a fluffy, cozy, feather bed feel. Spot clean only. $350.00 – $653.00 Affordable, thick wool topper. Choose a Soaring Heart Organic Wool Mattress Topper to add a layer of cloudy-soft goodness to your mattress. Two inches of organic wool batting, a blend of eight breeds of sheep’s wool, are layered and then hand-tufted inside of a silky-soft organic cotton sateen case. This organic wool mattress topper will help relieve tension in your muscles and regulate body temperature, letting you wake up feeling rested, fresh and restored. 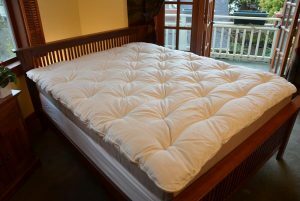 $660.00 – $972.00 An organic mattress topper featuring two inches of organic wool! The Suite Vesta Topper is an ultra plush 4 inch topper made from 3 inches of organic wool and 1 inch of natural latex for long term resiliance. Covered in a beautiful organic cotton floral fabric, this topper adds a soft pillowtop layer to any mattress. This organic mattress topper is our most plush! $599.00 – $1,299.00 Very plush latex and wool topper. This beautiful topper made by Green Sleep is 2.5 inches thick and made from 1.5 inches of natural rubber and covered in layers of Pure Wool and a luxurious organic cotton velour. 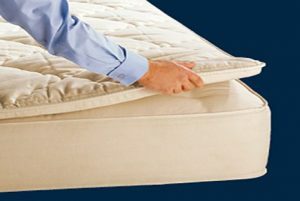 Want to soften your Green Sleep mattress, or just want a Green Sleep feel on top of your existing mattress? This topper is fantastic! 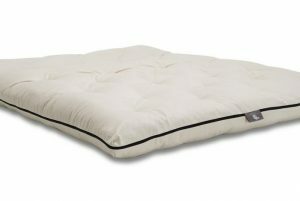 $598.00 – $1,198.00 Luxurious natural latex and wool topper. Previously called the Royal-Pedic Premier Organic Pillowtop Pads, these mattress toppers will add a feel of plushness to your Royal-Pedic or any mattress. Made with 2, 3, 4, or 5 inches of GOLS certified dunlop latex covered in organic French wool and premier organic cotton. $1,342.00 – $3,868.00 Choose two to five inches of natural Talalay latex. One of our most luxurious toppers! Previously called the R-P Natural Organic Pillowtop Pads, these mattress toppers will add a feel of plushness to your Royal-Pedic or any mattress. Made with 2, 3, or 4 inches of organic latex covered in organic French wool and premier organic cotton. 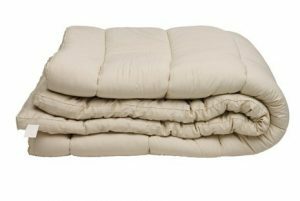 $1,064.00 – $2,636.00 Plush pillowtop with two, three or four inches of organic latex. $499.00 – $899.00 Natural rubber topper made with 2 inches of soft Dunlop latex. The Savvy Rest Harmony natural latex mattress topper has three inches of natural latex encased in an organic cotton and organic wool cover. Choose natural dunlop or natural talalay. $999.00 – $2,199.00 A three inch natural latex topper. Choose dunlop or talalay. 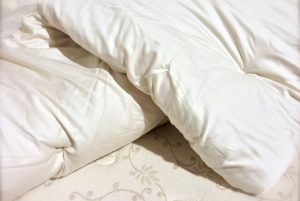 What type of natural mattress topper is best for you? Read our BLOG post. Our organic mattress toppers made from natural rubber or natural latex (can be used interchangeably) consist of a 2″ to 5″ layer of natural latex with a layer of quilted organic cotton and organic wool on top. The amount of wool in a natural latex topper is somewhat thin, and does not account for much of the soft feel- the latex is what makes the topper soft. The natural rubber toppers by Bella Sera, Little Lamb, and Suite Sleep are similar with a 2″ layer of natural dunlop rubber. 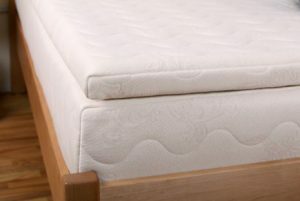 The Savvy Rest natural latex topper has a 3″ layer of either natural dunlop or natural talalay latex. The Freefrom natural latex topper has a 3″ piece of convoluted latex. 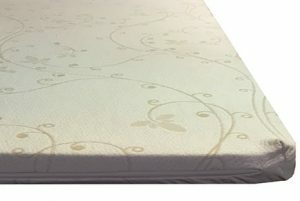 The Royal-Pedic Organic Mattress Toppers have a 2, 3, 4, or 5 inch layer of natural talalay latex. Our natural wool mattress toppers are made with a thick amount of wool quilted between two layers of organic cotton. The main difference between the Cozy Nest, Sleepy Sheep, Sleep and Beyond, Little Lamb and Suite Sleep is the amount of wool in them. 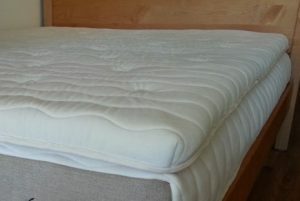 A wool mattress topper can give the top of a mattress a really nice plush or pillowy feel. Our Suite Sleep Suite Vesta mattress topper has both natural latex and wool for a plush feel with the resiliance of natural latex. Three inches of wool surrounds a 1 inch latex core for our most plush feeling mattress topper! 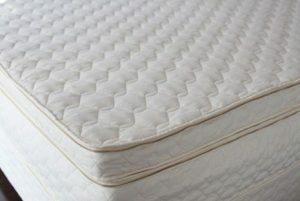 Please read our BLOG post for more information about how to choose an organic mattress topper.